The Atikokan Bass Classic is a small mouth bass fishing tournament, which takes place on Upper and Lower Marmion Lake (The Floodwaters). This huge reservoir is a fish factory. Flooded forests still stand and are hundreds of islands and reefs, making it a small mouth paradise. Anyone who loves to fish can enter the competition. We keep the entry fee low (only $500 a team), to make it better able for families to enter. For example, we have many father and son; grandfather and grandson; husband and wife; and ‘all women teams’ fishing this must attend event. No wonder the Atikokan Bass Classic is called the “funnest bass tournament in the Northwest”. Every year’s tournament begins with the Parade of Boats on the Thursday of the Tourney and the fishing takes place Friday and Saturday. In addition to the tourney, week long activities are being planned to coalesce with the weekend events being planned by the A.B.C. Organizing Committee. Suffice it to say, come one – come all, to this must attend premier Northwestern Ontario Event. Week long activities are being planned by the Mudflingers as well as the A.B.C. organizing committee. 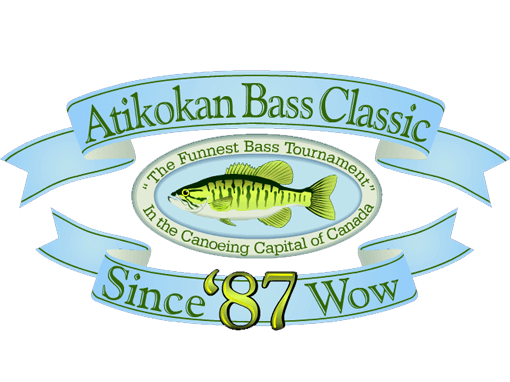 The 2017 Atikokan Bass Classic is set for August 18-19, 2017. Please view our web page http://www.atikokanbassclassic.ca for up-to-date information and event schedules, as well as lots of pictures, weigh-in stats and even a contest you can enter to win a quality rod and reel package.